Bill Reeder was born in 1945 in Lake Arrowhead, California. He enlisted in the U.S. Army on August 30, 1965, and was commissioned a 2d Lt in the U.S. Army through Artillery Officer Candidate School on August 16, 1966. His first assignment was with 6th Battalion, 21st Artillery Regiment of the 5th Mechanized Infantry Division at Fort Carson, Colorado, from September 1966 to October 1967, followed by fixed-wing aviator training from October 1967 to June 1968. After completing OV-1 Mohawk training, Capt Reeder served as an OV-1 Mohawk pilot with the 131st Aviation Company in South Vietnam from October 1968 to November 1969, and during this time he was shot down on March 1, 1969, but was rescued the same day. He then received an assignment to the University of Nebraska to complete his Bachelor's degree from February 1970 to June 1971, followed by rotary-wing aviator flight training from July to September 1971, and AH-1 Cobra training from September to December 1971. His next assignment was as an AH-1 pilot with the 361st Aviation Company in South Vietnam from December 1971 until he was shot down on March 9, 1972, managing to evade the enemy until he was captured and taken as a Prisoner of War on March 12, 1972. After spending 320 days in captivity, Capt Reeder was released during Operation Homecoming on March 27, 1973. He was briefly hospitalized to recover from his injuries at Fitzsimons Army Medical Center in Denver, Colorado, and then attended the Field Artillery Officer Advanced Course at Fort Sill, Oklahoma, from July 1973 to May 1974, followed by UH-1 refresher training from June to August 1974. His next assignment was as a Liaison Officer, Battery Commander, and S-2 Officer with the 1st Battalion, 11th Field Artillery Regiment at Fort Lewis, Washington, from September 1974 to June 1975, and then as an Aerial Surveillance Officer and staff officer with Headquarters U.S. Army Europe and with 7th Army in West Germany from November 1975 to November 1976. He then served as Executive Officer of the 334th Aviation Company, 11th Aviation Battalion, in West Germany from November 1976 to June 1977, and then as S-3 Officer with the 11th Aviation Battalion from June to December 1977. Maj Reeder attended Armed Forces Staff College at Norfolk, Virginia, from February to June 1978, followed by service as a UV-18B Twin Otter pilot and TAC Officer at the U.S. Air Force Academy from July 1978 to July 1981. Col Reeder's next assignment was as a TAC Officer and staff officer with the Defense Mapping Agency in Washington, D.C., from August 1981 to June 1983, and then as Deputy Brigade Commander and Executive Officer with the 9th Cavalry Brigade at Fort Lewis, Washington, from July 1983 to April 1985. He served as Commander of the 3rd Squadron, 5th Cavalry Regiment at Fort Lewis from April to December 1985, and then served as Aviation Colonel Assignment Officer with the U.S. Army Personnel Center at the Pentagon from December 1985 to March 1987. His next assignment was as Commander of 5th Squadron, 17th Cavalry Regiment at Fort Hood, Texas, from March to August 1987, and then as Commander of 1st Battalion, 3rd Aviation Regiment at Fort Hood from August 1987 to September 1988. Col Reeder served on the staff of III Corps at Fort Hood from September 1988 to January 1989, followed by Naval War College at Norfolk, Virginia, from January 1989 to August 1990. His next assignment was as Commander of the AH-64 Apache Training Brigade at Fort Hood from August 1990 to October 1992, and then as a Brigade Commander with III Corps at Fort Hood from October 1992 to April 1993. 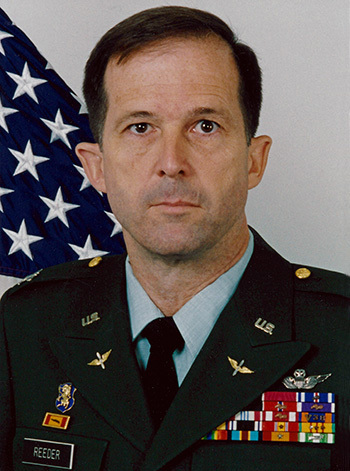 Col Reeder's final assignment was as Deputy Chief of Staff, U.S. Southern Command, at Fort Clayton, Panama, from April 1993 until his retirement from the Army on March 1, 1995. For gallantry during action against North Vietnamese Army forces on 14 April 1972, while serving as a helicopter pilot supporting the combat actions of friendly Vietnamese forces in Kontum Province, Republic of Vietnam. The outnumbered ground forces were under heavy artillery fire, surrounded by anti-aircraft weapons and under attack by enemy forces. Captain Reeder took out a number of lethal guns, all while under intense fire from multiple anti-aircraft positions and small caliber weapons. After rearming and refueling, Captain Reeder's team voluntarily returned to once again engage the enemy. In extraordinarily poor conditions of low clouds, haze, smoke and deepening darkness, his team prevented the friendly force from being overrun. Captain Reeder's actions contributed to the escape of dozens of friendly forces and one American soldier. His extraordinary heroism and selfless sacrifice reflect great credit upon himself, the 361st Aviation Company and the United States Army.